For the last year or so, the sommelier and I have been looking forward to our harvest trip to Napa. Not only because neither of us have had a real vacation in more than two years, but also because this year marks a special one for the sommelier, as he is turning thirty five. We were lucky enough to snag some exceptional winery tours, and while we were exposed to a variety of vineyards, with incomparable hosts and extraordinary vintages, there were a few that stood out among the group. This post is dedicated to our favorites. 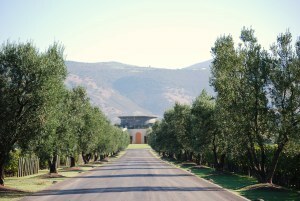 Opus One Winery: When driving up Highway 29 through Oakville, the uniqueness of the Opus One Estate is immediately evident. The design of the grounds resembles strong European descent, and slightly reminded me of the Roman influence in Bath, England. The limestone pillars arced around the courtyard, almost enclosing us in the morning valley sun. The California white oak that highlighted the doorways brought a rustic American influence, and created a beautiful contrast to the hard stone. Immediately you knew that you were standing in a work of art, not to mention the luscious landscape of grapevines surrounding the Oakville property, which still held Cabernet Sauvignon. We arrived early, so we took advantage of the time on the veranda to take in some views of Oakville. As soon as the tour started, our host, Caleb Dial, brought us out to the vineyard to explain how the vintners cultivate the grapes at Opus One. For those who don’t know, Opus One is collaboration between Baron Philippe de Rothschild and Robert Mondavi, and signifies a true relationship between French and California styles. 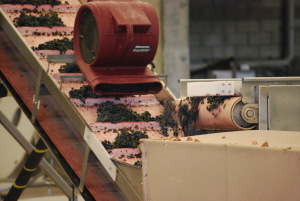 The one produced wine is manifested in a blend of five grape varietals: Cabernet Sauvignon, Cabernet Franc, Merlot, Malbec, and Petit Verdot. What I most like about the tour of Opus One was the thorough education we received about the wine making process. From the pruning of the vines to the chemistry of the grape, we were able to see and feel the development of the vintage. After our visit on the grounds, we ventured inside to see the sorting of the clusters; at Opus One, this is done mechanically, which of course, increases efficiency and decreases human error. 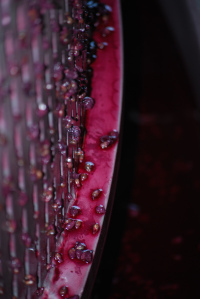 After this process, the grapes are transferred into stainless steel holding tanks, were they are allowed to soak on their skins and begin fermentation. Once this process is complete, the winemaker will empty the tanks into New French Oak barrels, where they are aged appropriately. 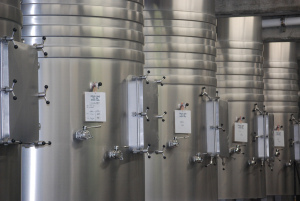 While at Opus, we were able to see the final pressing of what must and skins were left at the bottom of the stainless steel tanks, which is further pressed to create a second pressed wine, which is also aged in oak barrels. Once all the young wines are aged and ready for blending, the winemaker decides at what percentages each varietal, as well as the second press wine, is used to create the Opus One Bordeaux Blend. 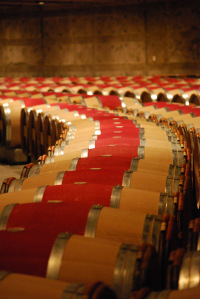 The Barrel Room was beautiful, with rows upon rows of fresh French Oak. During our visit, the barrels were still awaiting the concoction, so the space was anticipatory, and smelled of toasted wood. On the tangent of the area we found the most recent vintage of Opus One, the 2008 Blend, waiting for us to taste. This particular vintage was allowed to sit on the skins for 22 days, and then aged in New French Oak for 17 months. 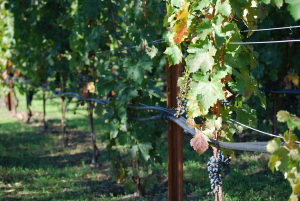 2008 was an extraordinary weather year for Oakville, and as such, the yield was rather small. From what I understood from the tour, however, is that the smaller harvest can sometimes produce more robust wines, with more intense flavor. This vintage was gorgeous, with immediate notes of black currant and licorice. It had a dark, red ruby color and smooth, bright flavor of wine that was not too fruit heavy. Caleb was very patient with us as we asked various questions; he was even so good as to give the sommelier some advice on the third level Court of Master Sommelier Exam. Out of all of our tours over the four day span, I definitely learned the most about wine making from Opus One, and if the way they care to educate their clients even slightly resembles the care in which they make their wine, it is no wonder that Opus One continues to be an award winner year over year. Peter Michael Winery: I think we spent about an hour in the car driving North on 29, forking in Calistoga, and forging into the Knights Valley to find ourselves at Peter Michael Winery. There was no considerable sign, in fact there was no sign at all, only a small board that read: Trout Fishing. The sommelier turned down a rocky gravel road, and soon we found ourselves pulling in to the estate, parking next to employees. It was obvious that this tour was private, as there was no evidence of even a public tasting room. 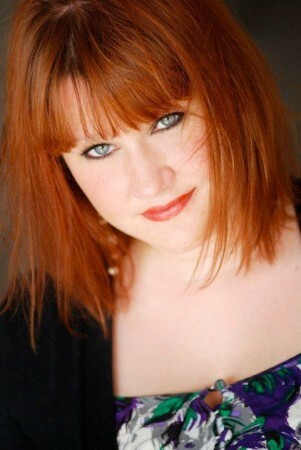 We met Morgan Melkonian, our host, in the winery offices, where she promptly loaded us into a passenger van. I was bit intrigued, as we had not yet experienced such personable hospitality as of yet. On our way up the hillside, she explained the history of the winery. 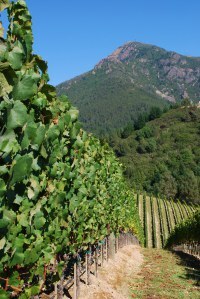 Sir Peter Michael sought out the acreage in the early 1980s, where he planned on creating a vineyard and family retreat. As we made our way through the estate, Morgan pointed out the pond in which the grandchildren played during the summer months, the original restored cabins, and the creek that runs throughout the winery. It was apparent why Sir Peter Michael chose this particular piece of land, the rolling hills and consistent water source make for a formidable place to clear your mind, as well as an immense return on investment. As we drove through the vineyards, continuing to climb the hillside, our party was literally jumping out of their seats, camera in hand. The sun was shining perfectly onto the grapevines, the plump red fruit almost ready to harvest. 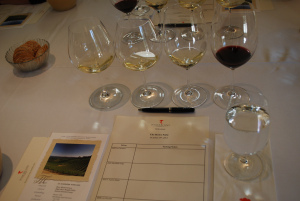 Some of the most famous names in the industry have served as Peter Michael’s winemaker: Helen Turley, Mark Aubert, Vanessa Wong, Luc Morlet, and current winemaker Nicolas Morlet. The history here is impressive. We finally came to a stop at the top of the hillside, where the views were the most stunning of our entire trip. We slowly exited the van, and continued on to learn about the winemaking details at Peter Michael. We were shown the different grape varietals, and were able to taste some lingering Chardonnay. All of the wines at Peter Michael are made with Estate grapes, less five percent sourced from other areas. This makes for outstanding vintages, as these are the first vineyards to be planted on the estate. Before Sir Peter Michael bought the acreage, the land was being used for cattle grazing, so the soil has not been exhausted with years of harvesting. Once we fatigued our camera batteries, we were taken back down the hillside to the estate offices for our tasting. Here we found that the winery models after French tradition, with a few modern influences. In addition, Sir Peter Michael has made a commitment to keep the winery family owned for 100 years, and has already started to hand over the winery to his son for future vintages. The wine that is made here is not available to the public directly, but rather distributed throughout the country and available via winery member allocations. 2010 L’Apres-Midi Sauvignon Blanc: immediately on the nose I experienced the flavors of honey and grapefruit; very long and elegant, the minerality was evident on the finish. 2009 Ma Belle-Fille Chardonnay: instantly I had a sense of peach and tangerine; the flavors included a brioche and almond concentration, the mouth layered and the finish long. 2009 La Carriere Chardonnay: aromas of pastry, lily, and honey filled the nose; in the mouth the wine was bright and very mineral. This particular chardonnay will age for up to two decades. 2008 Les Pavots Bordeaux Blend: a bouquet of black currant, cherry, and licorice was immediate, followed by chocolate and vanilla; the complexity of the wine continued into the finish, as the impression was silky and smooth. The sommelier commented that this was one of the most well made wines of 2008 in the region. Morgan was a gracious host and eager to provide us answers to all of our questions. It was apparent on why she was so perfect for her position, as she tailored our tour to our level of knowledge and enthusiasm. 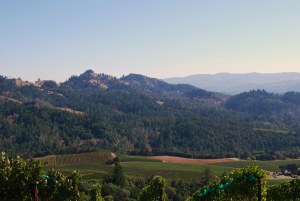 Peter Michael has produced some stupendous wines, and is being continually recognized as a top notch winery among the critics. Although it is not easy to obtain retail, it is available in select restaurants. In San Antonio, you can find it at The Sandbar Fish House & Market, among others. 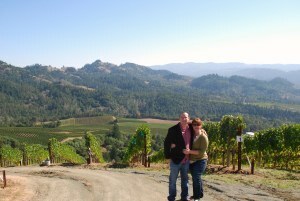 All of our winery tours were amazing, the weather perfect, and the vintages marvelous. The sommelier and I adored everything. Please look for my next post, a photo essay, to be published soon with regard to our adventures elsewhere.